The professionals can juggle a soccer ball forever. No, really--we have proof. Check out this video of professional soccer player Jenny Hammond showing off her juggling skills. We asked her to juggle for a while at the end of an hour-long conditioning workout, despite her having tired legs. She did 271 juggles, then did a nifty little trick before quitting on her own after we told her we were running out of tape. While not exactly a game-used talent, juggling is thought by most soccer coaches as a great skill to have. It gives you comfort with the soccer ball, which is crucial. It helps with your foot coordination. And juggling for a long period of time is more challenging than most ball skills you may be asked to do in a game. The art of juggling always gets a lot of attention in the soccer world, and this is your chance to boost your ability and see for yourself how it carries over to your technical skills. Active.com has several resources available for jugglers at all levels--beginners, advanced, and the most impressive of them all: the freestyle soccer players. 5 Tips for Juggling Like the Pros -- Jenny Hammond showed you how she does it. Now, she goes back to square one and shows you how to get started. Soccer Warm-Up: Juggling In Pairs -- This article offers several drills for jugglers of all abilities--perfect for practices or in pregame. Take Juggling to New Heights -- Getting good at juggling? Don't be satisfied. These drills will help advanced jugglers learn how to take even better control of the ball. 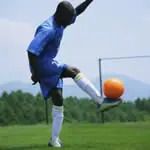 Freestyle Soccer: Tricks for the Best Jugglers -- Freestyle soccer is an elite sport, but any soccer player can strive to put amazing creativity into their juggling. Here's a video of a top freestyle player in action--and tips on how to slowly expand your juggling skills. One Pro's Take on the Importance of Juggling -- MLS standout Geoff Cameron spent a lot of free time during his childhood trying to improve his juggling. Here are is his reasons why every young player should embrace the skill. Video: Soccer Juggling Fundamentals -- Whether you're new at juggling or looking for another challenge, this video by Keith Faulk of the IMG Soccer Academy is a great resource to becoming the best juggler on your team. See more soccer training tips or find a soccer league near you. How Much Should Soccer Players Weigh?